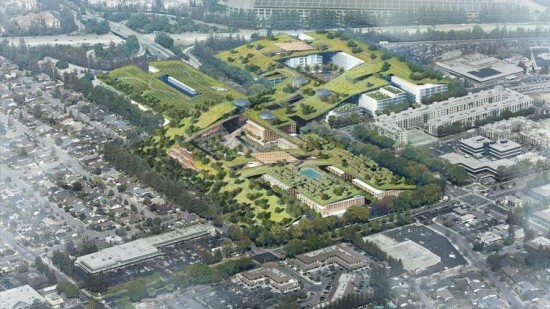 Green roofs these days are the new blacktops. 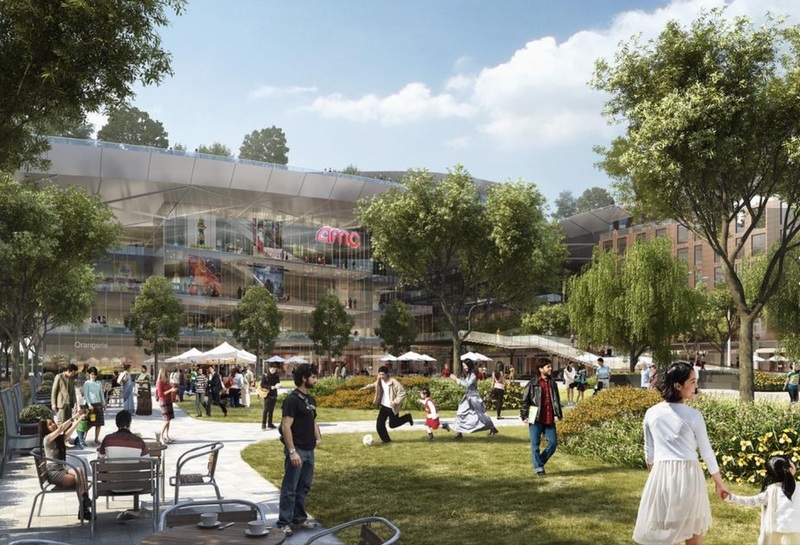 And just when you thought they couldn’t get any bigger, there are now plans to build a 30-acre park blanketing a mixed-use, $3 billion development in Cupertino, California. Right now, the site is the dying Vallco Shopping Mall. Developers Sand Hill Property bought the mall last year and hired Rafael Viñoly and Olin Landscape Architects to redevelop the 50 acre site. 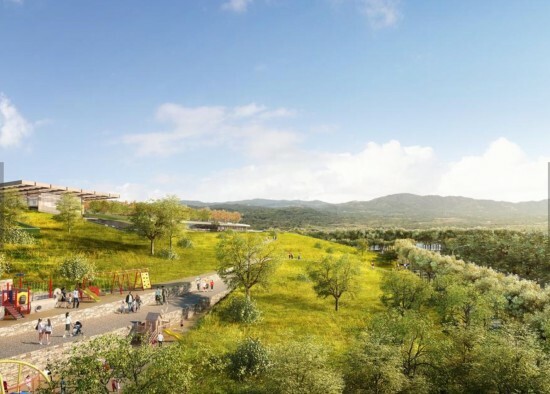 Renderings show a rolling lush carpet of green capping a 15-block grid of buildings below. But that green is not just a lawn. 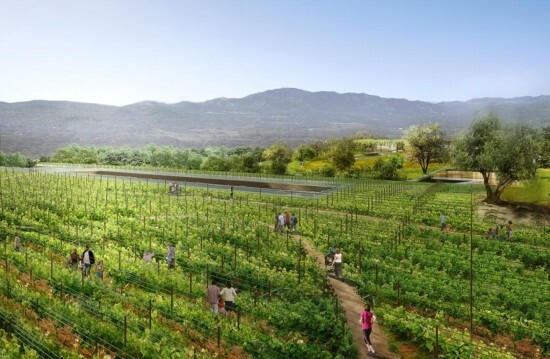 The rooftop park will feature quite an unusual mix of amenities: a vineyard, close to four miles of trails, an orchard, a playground, as well as lots of oak trees. 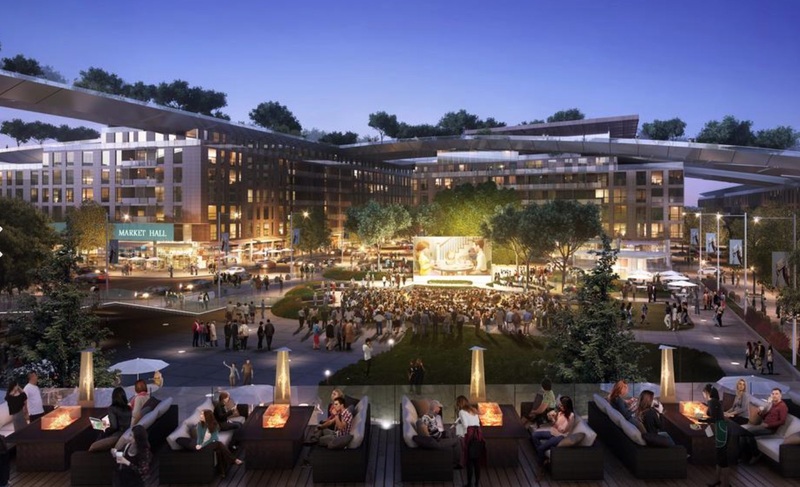 Plans also include 800 apartments and over 250,000 square feet of retail. There are multiple plazas, a market hall, 2 million square feet of offices, and parking mostly below ground. The highest point in the development would top out at seven stories. “To secure the community buy-in, the developer is going all-out, promising to contribute more than $40 million to build a new K-5 elementary school, replace portable classrooms and provide an “innovation center” to the Fremont Union High School District, among other goodies,” reported the SVBJ.